They kick a soccer ball to save children and for a drug-free world, and they kick it better than anybody. Across their shirts are the words: "Drugs No, Sports Yes." In 1978, Rolando Aguilera Pareja returned to Santa Cruz, Bolivia, after a seven-year exile in the United States. The time spent away from his home hadn't eroded his love for his country nor his passion for his favorite sport. The son of a professional soccer player, Aguilera committed himself upon his return to passing on his family's tradition for playing soccer to his two young sons Roly and Erwin. He enlisted a former player (a Brazilian named Dede) to help teach the boys the basics. It wasn't long before other family members and neighborhood children became interested in soccer too. Together the group formed a team calling themselves Bloomingcito (Little Blooming). But they needed a competitor, so a former goalkeeper from the Bolivian professional team Oriente Petrolero, a friend of Aguilera's, formed Orientito to provide a rival. Together the teams decided to schedule an exhibition match in 1979 in Santa Cruz's stadium. What follows is history—one of the most beautiful and spectacular stories in soccer history. Spectators were awed with the skillful play of these 8-year old boys. So much so that over 200 parents sought out Aguilera to register their children on the team. The overwhelming response planted the seed for the Tahuichi Academy. Tahuichi's success since that fateful day in March 1979 has been unprecedented. Within the year they won the Bolivian national championships. Soon after they made international news when they tied 0-0 with Sao Paolo of Brazil. In January 1980, in Buenos Aires, Tahuichi beat Independiente of Argentina 4-1 in front of 50,000 spectators to win the South American Championships. Club Palmeiras of Brazil finished third. With the emergence of the "Tahuichi Aguilera" Soccer Academy, a new international image of Bolivia's youth soccer had been born. Tahuichi now has over 3,000 children in age groups from Under-5 to Under-19. Since 1978 more than 150,000 children have passed through its doors. 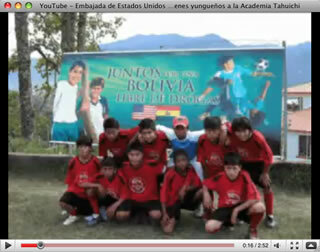 Their select teams travel the world playing soccer and serving as Bolivian "ambassadors of friendship and brotherhood". They have won hundreds of international matches with only a handful of defeats. They have won the Gothia Cup of Sweden (the largest youth tournament in the world) and the Dallas Cup (one of the most prestigious U.S. tournaments) more than any other club or academy. They participated in the inaugural FIFA Under-16 World Cup in China through a special invitation from FIFA. With their skill and creativity, they have won the FIFA World Youth Club Championship, the South American Championship of Clubs and numerous other very prestigious tournaments in England, Denmark, Holland, Finland, Spain, Brazil and Paraguay. They have played the best, and beaten the best. But winning international tournaments and developing international caliber players are not the only reasons for Tahuichi's existence. Originally developed as a soccer institution, Tahuichi has since transformed into a socio-cultural institution. Through soccer it emphasizes "hard work and organization" to develop highly motivated, successful citizens. While only a small fraction of Tahuichi graduates make it to soccer's elite level, all are taught a "positive winning attitude". Along with two hours of daily soccer instruction, the academy provides basic health and nutrition. Most of the children who come to Tahuichi are malnourished and poverty-stricken. Many are disadvantaged, living in the streets and orphaned. Tahuichi teaches soccer and gives the children a chance to a better life. The academy's outstanding accomplishments have made it a candidate for a Nobel Peace Prize five times (coming in as a finalist twice). They have been designated "Ambassadors for Youth Against Drugs" by the United Nations. In February 2001, FIFA President Joseph Blatter bestowed upon them the FIFA Medal of Gold. Since 90% of the over 3,000 children that go to the academy do not pay a cent, money has historically come from outside sources such as contributions through the non-profit Tahuichi Children's Foundation and international summer camp programs like the Tahuichi Way. These funds cover operating costs, including a staffed emergency clinic. Currently the academy is seeking contributions to build a soccer field complex/health clinic, slated to be called "Villa del Niño Feliz Tahuichi" (Home of the Happy Child "Tahuichi"). It is hoped that the fields will bring people to the clinic on a regular basis, helping alleviate many of the existing health problems.